Being a leader in any capacity is not easy, but being an effective leader in a self-managed environment is especially difficult. Passion and Dedication plays an important part in the success of a person, only you need to Push your limits and suffocate in your comfort zone. Arya College Alumni: Punit Jain also follows the same path and become one of the early-age entrepreneurs all over India. He belongs to a family in Sikar, Rajasthan which does business across various sectors like Pharmaceuticals, Real-State, and Textiles. Punit never wanted to do the family business, as he was inclined towards technology and entrepreneurship. The entrepreneurship bug bites him in early stages of life and with no time he had launched a start-up at the age of 16. He has done his Graduation from Computer Science Department of Arya College. Also, He has been part of many Television shows and was broadcasted on DD National, Covered by BW (Business World) Magazine, invited to become the part of Ministry of Skill Development and Entrepreneurship in their skill development workshop. He was also selected as a Judge in many start-up forums across India. Recently, he was invited as a Mentor at Rajasthan Digi-Fest. Punit`s fascination towards technology led him to launch IncubateInd for young engineers. He believes that the largest problem of the state and the entire country can be solved only by using technology in a right manner. His mission aim was the skill and basic coding development towards the young audience so that they can get a respectable livelihood for themselves. He has also been part of many college events and has always been at the forefront of organizing College fests. The exposure of handling and executing large college events had seeded the idea of IncubateInd, which is going to become a India’s Premiere Hackathon Company. The main aim of these Hackathons is to help corporate hiring the best talents based on the skill tests, ability to perform in a stressed situation with deadlines hanging on their heads. 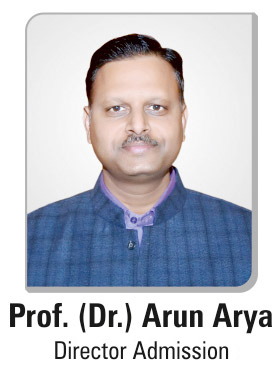 His experience at Arya College of Engineering and IT helped him to generate this idea in the form of IncuabteInd. He has also gained practical knowledge during his graduation days that helped him to perform at the highest order. For large corporate, IncubateInd is making the tech-hiring easy by giving them the focused talent at a much lower acquisition cost. IncubateINC currently works with brands like Vistara, HCL, Dish TV, Nestle, State Bank of India and many other brands. At IncubateInd, almost 10 interns from various colleges across India will work with Punit and IncubateInd to learn about various functions of start-ups. Media Hackathon was the first event that IncubateInd did in Rajasthan. The event was a runaway success partnered with organizations like Times Internet, News18, Indian Express, Vice Media, Doordarshan.Media Hackathon was a great experience for Punit, as he got very good responses from the students and College Authorities and corporate like India Today. In his early start-up during College time, FARHOM was based on the cause of Nutrition amongst the young kids. Last Year, it had distributed 1000 fruit boxes to underprivileged kids in Jaipur. The awareness campaign was covered in major National daily Newspapers and Radio Stations across Rajasthan. It was a hyper-local delivery platform, which was amongst the first few start-ups and does the robust business in 2015-2016. The college friends and founders have given the funds over Rs. 1 crore. IncubateInd is pivoting into a fully fledged media website due to his bright leadership and attention towards the company which will cover news about new technology trends. The video platform that IncubateIND has recently launched, is gaining attraction amongst the tech enthusiasts. By the end of 2018, IncubateInd plans to go international and has set up an eye on the Middle East as the first destination. Arya College is wishing a very Good Luck and Bright Future to the young talent: Punit Jain.